In which G.M. Norton takes his new suit on a strange little outing. A milestone for any gentleman, I recently acquired my first ever three-piece tweed suit. A grey number, with a red windowpane check, it is from Messrs Walker Slater. They have clothing emporiums in both Edinburgh and Londinium but as I reside near neither, I made my purchase online. I'll tell you a little story, if I may. I used to own a grey wool suit. Grey is a safe suit colour choice, it goes with absolutely all kinds of things. It is probably the most versatile suit you could own. Anyway, one morning last year I was at the local petrol station as my motorcar was in need of a little nourishment. My petrol cap sits on the right of the car but there were no corresponding petrol pumps free allowing easy access for refuelling. "Ah," thought I. "I will stretch the hose thingy over the car." So I did, with horrifying consequences. The petrol pump was so taut that when I released it away from my car, it pulled back, somehow releasing petrol over my grey suit. To cut a tedious story short, my suit was ruined. No dry cleaner would touch it for fear of inflammation and attempts to hand wash it somehow destroyed the fabric. At this juncture, you may be thinking "Poppycock! Nobody can be so foolish. You did it on purpose so you could buy a new suit." I'm afraid I can be quite idiotic at the best of times. Still, at least I'm aware of my shortcomings. So, that was one whole year ago. A year without my trusty grey suit. Thankfully, I now have a new one. Do you like it? I'm wearing the Legends London Maximum Hold Hair Gel too. As far as the suit goes, Walker Slater were absolutely super to deal with. I actually bought it in stages - the trousers coming first, followed by the waistcoat and finally the jacket. They kindly put the items to one side for me until I was ready to purchase. These pictorials were taken, larking about near the office. I believe they may be used in some sort of Halloween publicity. I must confess, I wasn't paying too much attention. Here is more evidence of my silly behaviour. 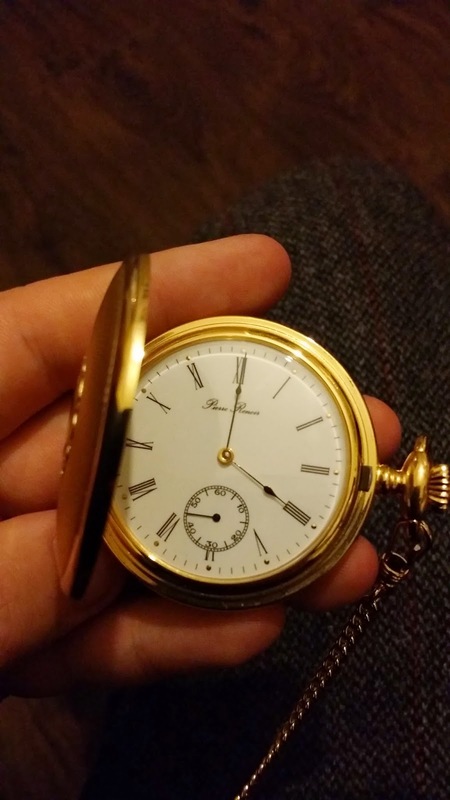 When one wears a waistcoat, a pocket watch is a must. The one I am wearing was an extremely kind gift from the lovely people at Creative Watch Co. in Birmingham. If you are ever in need of a timepiece, I would have no hesitation in recommending this independent business. 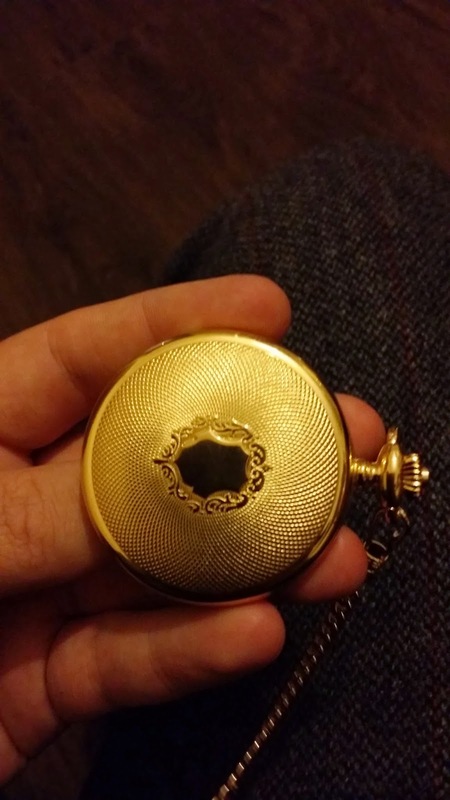 It is a Swiss mechanical full hunter pocket watch, ensuring I am never late for any important dates. Speaking of which, I must dash! Toodle pip.